Stackable upholstered armchair. 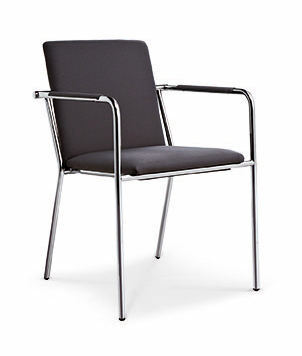 Tubular steel frame with polished chrome finish. Seat, back and armrests upholstered with vinyl, fabric, or leather. Available with horizontal channel stitch. Stacks 5 high. Minimum quantity of 8 for COM/COL projects. Horizontal channel stitch - $30.